The first step in answering these questions is to find credible data about Ithaca’s weather and climate that can be used to answer this question. I’ve gathered data from the Northeast Regional Climate Center , and Weather.com  in order to find out what’s going on. A usual June and July in Ithaca has a maximum average temperature of 78° F and almost 8 inches of rain. From June 1 – July 22, 2012 the average maximum temperature was 81° F with 3.3 inches of rain. This has resulted in the Northeast Regional Climate Center declaring a moderate drought for Tompkins County. In other words, our summer so far is not unusually hot, but it has been unusually dry. How does this compare with the rest of the country? Over half of all US counties are experiencing drought. The National Integrated Drought Information System (NIDIS) has declared that large swaths of the midwest, southeast, central, and western US are experiencing severe, extreme, or exceptional drought conditions . The worst droughts are in the central and midwestern US which are several inches short of their usual precipitation . Are this year’s droughts exceptional? It depends on what do you mean by drought and how you would categorize a drought as exceptional. The following two views demonstrate two different interpretations of the data. This year’s droughts appear exceptional when you consider the total size of all US counties in drought conditions, known as drought area. In June over half of US counties were experiencing drought making this the sixth largest drought area since 1895 . Only September 1931, July 1934, December 1939, July 1954, and December 1956 had larger drought areas. An accurate interpretation could be that June was the fifth worst drought in 117 years. Framed in that way, this current drought seems very exceptional. On the other hand, when considering the frequency and length of droughts in the United States this summer’s droughts appear less exceptional. Notable droughts occur every 10 to 15 years; some last one year and others several. Notable droughts have occurred in 1910-1913, 1931-1940 (the Dust Bowl), 1947, the mid-1950s, 1961-1966, the mid-1970s, 1980-1981, 1987-1988, 1996, and the early 2000s . Looked at this way, this summer’s drought is not particularly long nor is it just one of an unusually frequent chain of droughts. How do we reconcile these two different interpretations? Can we declare that this summer’s drought is a direct result of climate change? It is inappropriate to determine if a particular weather phenomena in a single year is a result of climate change. This is because climate is by definition a long-term perspective (decades at least), and thus change in climate can only be determined when we look at long term record. If this summer’s droughts last several years, or turned into a chain of recurring droughts, then we may be able to assess it as a climate trend. A single drought event, no matter how severe, could simply be natural variation in weather. Nonetheless, we cannot ignore the severity of this year’s droughts. As climate change continues to drive up global temperatures and bring us into an age of new and unknown climate conditions, we should expect more frequent or severe droughts, or both. Our emissions are altering the global climate, and we need to look this fact straight in the face, stand up, and take responsibility for our actions. 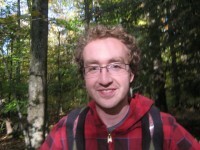 Ben Brown-Steiner is a Cornell PhD candidate studying climate change and atmospheric chemistry, focusing on the interactions between climate change and air quality. He is very interested in engaging in dialogue between the scientific world and the non-scientific world, and hopes to answer questions, provide references, and explain the current state of climate science and energy saving solutions in a way that is both engaging and informative. This is a sobering statement. Because we’ve got a surface melt going in Greenland thanks to our consumption of fossil fuel, we’ve created a positive feedback loop of staggering proportions. It’s hard to contemplate. But, we also know that as the Greenland glaciers melt, the water will run into the Atlantic Ocean and will short circuit the flow of the warm Gulf Stream as it comes up our eastern coast and circulates over to Great Britain and Europe’s coasts. This will likely create a significant cooling effect, especially for Britain. My question to you, Ben, is whether climate scientists are making any progress at predicting how these two feedback loops will interact? As the albedo dims up north and the Earth warms even faster, how will the warming interact with the cooling of a broken Gulf Stream for the Northeastern part of North America? From what I’ve seen, the climate science community is focusing a large amount of its efforts into understanding, characterizing, and quantifying all types of climate feedbacks. The next IPCC report, due out in 2013, is trying to summarize all the information we currently have, plus the gaps that we are currently aware of, so expect some good info to come from this next report. A sobering and enlightening look at Arctic Sea Ice can be found here: An update on the Arctic sea-ice, from RealClimate. The provided graph shows how much seasonal variation there during the course of one year, plus the interannual variability in the sea ice extent from year-to-year. This year is certainly breaking records. As to the potential for the cooling (or breaking) of the Gulf Stream / Arctic circulation, let me gather some information and get back to you all. It’s a complicated, uncertain, and worrying potential problem. We don’t know if we’re near a tipping point.